Designing your perfect pushup workout is a worthwhile endeavor. Pushups are one of the best training methods for getting into great shape. Push ups are one of the most inexpensive ways to build a great mind and body. All you need for the perfect pushup workout is yourself and a floor. Of course, the perfect pushup workout is not going to be easy, because pushups are not easy! But the results of pushups are nothing short of spectacular. Stronger arms, shoulders, chest, abs, posture and more inner confidence. So, here are some tips to get you on the road to the perfect pushup workout. When you start to feel stronger physically, you will be up for more challenges. Such as heavier compound weight training, like deadlifts and squats. You will have more confidence and have the potential to take on every day as if it was your birthday. First thing in the morning you might be a bit groggy or refreshed. You are rushing to work, you shower, shave, hurry off to the bus or train. It is easy to prioritize the needs of others over yourself. If you leave your pushup workout till later, there is a good chance that you won't do it. Also, it is more effective to do your pushups on an empty stomach. You will be lighter and be less tempted to eat cookies after building your body with pushups. Instead, you will want to eat a healthy breakfast that will fuel your muscles and not your fat. Use a Hardwood Floor instead of Carpet. Carpet slips, slides, and moves underneath you. Just like life, a stable foundation will give you the most support for your pushup workout. Plus, you get a better grip on hardwood or non slippery tile than you will on carpet. So, do not mind the coldness of the floor, just hold on and do your pushups. Use a Watch with a Second Hand. I started with one pushup back in the summer of 2012. I was over 55, over 275 pounds and struggling with a 50 inch waist. I could not bend down to tie my shoes, let alone do a pushup. But, eventually, I could do one, after I lost enough weight. Every other day, I added one pushup when I was able to. For many weeks, I could not do more than a few. The first set that I did every other day during the week, was the maximum number of pushups. Then, I did 5 sets of 1 pushup with 1 to 3 minutes rest in between sets. This is the method of Roger Bannister who broke the 4 minute mile back in 1956. Supposedly he broke down his goal into chunks, a quarter mile under a minute, then he rested, then another quarter mile and so on, until his rest periods got shorter and he was able to string together an entire mile under 4 minutes. You can do something similar, do 1 pushup, wait a minute, then another and repeat 5 times, and keep building on that 1 pushup. You need the second hand to keep your rest period to a minute. Start small and build on your push ups workout gradually. By start small, I mean even one. 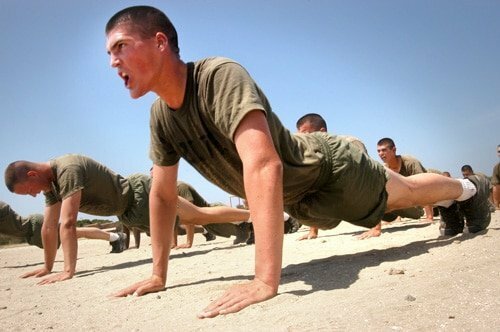 If you can only do one pushup, then do one, wait a minute, then do another. Over the course of weeks, months , your pushups will increase. Lets keep the goal very basic, one hundred consecutive pushups. I am not up to it, but I am doing more consecutive pushups now than I was years ago, and it shows. So, build up your pushup workout gradually. Eventually, you will be able to do 20, 20, 20, 20 and 20 pushups with one minute rest. When you get to that point, start to shorten the rest period, boy will you be strong! Do your Pushup Workout Every Other Day. For now, till you get up to 5 sets of 20, do your push ups workout every day to get you into the pattern. Eventually, you will get up to one hundred pushups consecutively. Sure, you can take a rest day in between, just don't pig out on junk food. Remember that you are pushing up your weight. If you gain weight, pushups will be harder than they are now. So, this is an added benefit of weight loss for the perfect pushup workout. Lighten up your body weight so you can do more good form pushups.